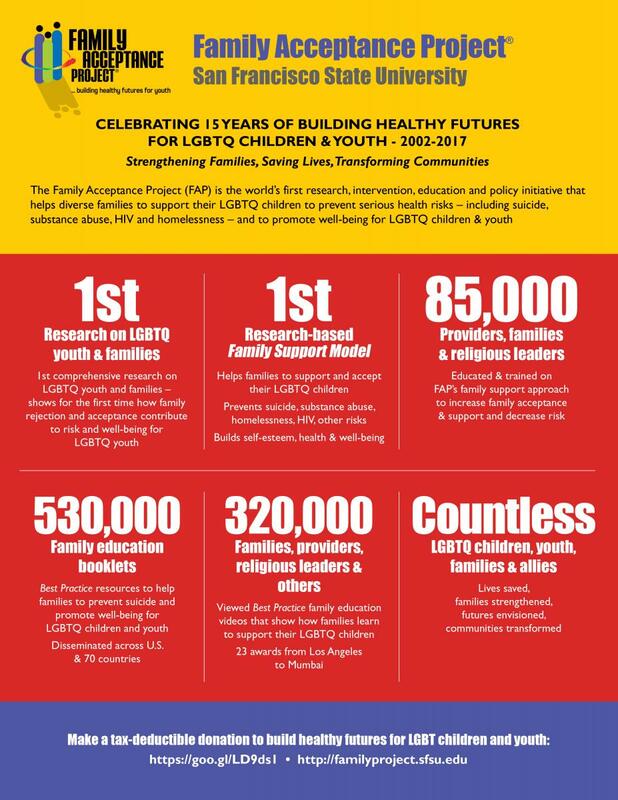 Key accomplishments for the Family Acceptance Project during our first 15 years to establish the field of family acceptance and support for LGBTQ children and youth — from research to practice to informed public policy and evidence-based care. The Family Acceptance Project (FAP) is the world's first research, intervention, education and policy initiative that helps diverse families to support their LGBTQ children to prevent serious health risks - including suicide, substance abuse, HIV and homlessness - and to promote well-being for LGBTQ children and youth. 1st comprehensive research on LGBTQ youth and families - shows for the first time how family rejection and acceptance contribute to risk and well-being for LGBTQ youth. Helps families to support and accept their LGBTQ children. Prevents suicide, substance abuse, homlessness, HIV, and other risks. Builds self-esteem, health & well-being. Educated & trained on FAP's family support approach to increase family acceptance & support and decrease risk. Best Practice resources to help families to prevent suicide and promote well-being for LGBTQ children and youth. Disseminated across U.S. and 70 countries. Viewed Best Practice family education videos that show how families learn to support their LGBTQ children. 23 awards from Los Angeles to Mumbai. Lives saved, families strengthened, futures envisioned, communities transformed.